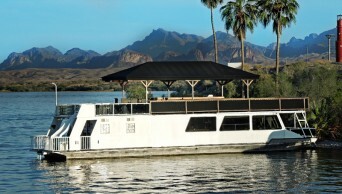 Book Online Make a Payment Resort Information Why is Lake Havasu Water Level always so High? Discover beautiful Lake Havasu! Less than five hours from Los Angeles and two hours from Phoenix. 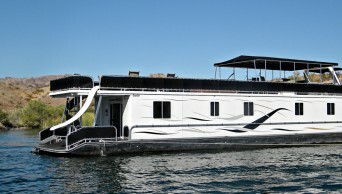 Lake Havasu provides the perfect setting for a relaxing and enjoyable family Houseboat vacation. Whether it's for a week, or just a few days, Lake Havasu is the perfect getaway. 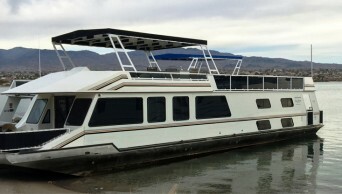 And we make the Lake Havasu Houseboat Rental process easy! 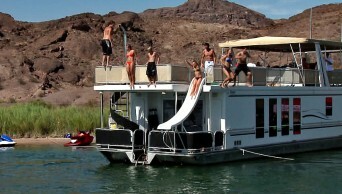 And Lake Havasu does not have the water level issues the other Houseboat Companies have. Lake Havasu water level remains at more than 95% full year round. 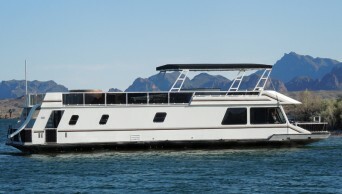 We offer the most luxurious houseboats on Lake Havasu, filled with all the amenities you have in your own home. Enjoy this beautiful, yet uncrowded lake surrounded by colorful desert mountains. With miles of shoreline, you can have your own secluded cove to spend your days swimming, water skiing, fishing, or just relaxing and enjoying quality time with your family and friends. Fishing is excellent with a variety of species, including largemouth bass, striped bass, blue gil and catfish. At night, after watching the spectacular desert sunsets, sit on the upper deck and look for shooting stars! Located at the Nautical Beach Front Resort since 1999-The only resort of its kind-right on the Colorado River-Our Marina is the only location that allows you to drive right up to your houseboat to load and unload. No long treks in carts!